Hartpury University are going for a third straight title, but can Leeds Beckett stop them? 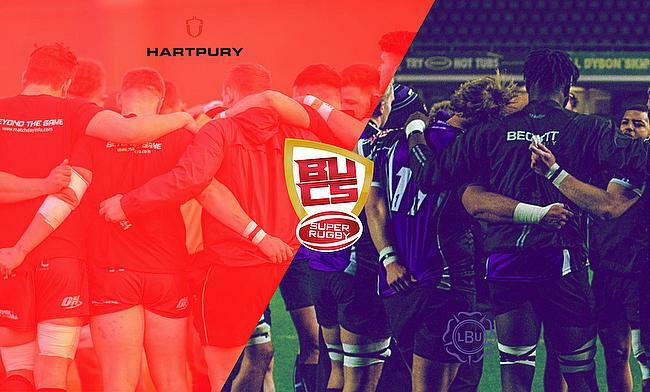 Leeds Beckett are making their BUCS Super Rugby final debut whilst Hartpury are no strangers to this occasion having won the competition for the last two seasons. Will it be a hat-trick of titles for Sean Lynn’s side or will we have a new name on the trophy by the end of Wednesday afternoon? Ahead of the final, we spoke with both camps…. You can never accuse BUCS Super Rugby of being dull. Since the league was introduced in 2016, it has delivered drama as well as heaps of unpredictability. This year was no exception and Leeds Beckett are a prime example of what BUCS Super Rugby is all about. Just two wins from their first nine matches left Kerry Wood’s side languishing in the relegation spot and any thoughts of a Twickenham final would have seemed absurd at the beginning of December. However, after a 30-3 loss to newly promoted Cardiff University, which saw Beckett fall to the foot of the division, the club acknowledged their position and completely turned their fortunes around. Clearly, it has been a ‘positive experience’ for Beckett and after pressing the reset button, their tough approach has paid off. Just after Christmas, TRU’s Joe Harvey interviewed winger Chester Duff who was adamant his side could have a crack at Twickenham and that is exactly what the Yorkshire outfit have achieved. They enter their maiden BUCS Super Rugby Championship final having not lost any of their last 11 games and their excellent quarter-final win over Cardiff Met was backed up by a superb performance in the last four at the home of the domestic champions, Exeter. “For us as a team in the lead up to Exeter, the attitude that was bouncing around the boys was the fact that we were unbeaten in 10 games and we were going to make it 11,” added Theron. “We have got this run of form and we were going to make the most of it. There was definitely a feeling around camp that we were going to go there and win which helped us, I think. This may well be Beckett’s first BUCS Super Rugby final, but they did triumph at Twickenham in 2014-15 when they beat Loughborough 31-23 in the old BUCS Championship competition. However, it is all about the here and now and this tremendous campaign for Beckett is set-up for a roaring conclusion. The likes of John Okafor, Jonny Teague, Will Lewin and Chester Duff have fired their side into a Twickenham final and for Theron, who is completing his masters at the university, victory at England HQ would be special. He added: “For me, coming to Leeds Beckett, the academics was as important as the rugby. I was lucky to use rugby as something that would bring me to the UK from South Africa. I think in terms of my rugby, winning on Wednesday would be big but it wouldn’t only mean a lot for the boys at the top level of the club, I think the whole day means a lot to the entire club. Awaiting Leeds Beckett at the national stadium are Hartpury University and Theron also told TRU "Twickenham is like Hartpury’s second home" and it is tough to disagree with him. BUCS Super Rugby has belonged to Sean Lynn’s side ever since the inaugural season in 2016-17. That year, the Gloucestershire outfit were inspired by current Bristol Bear Harry Randall who scored two second-half tries to clinch the title against Exeter and 12 months ago, Hartpury recovered from a stunning fightback by Cardiff Met to secure their second BUCS Super Rugby crown. It is hard to think of a university final without Hartpury and after finishing second behind old foes Exeter in the league this season, they once again showed their experience in the play-offs. A battling victory over Northumbria University set-up a last four encounter with an in-form University of Bath side and Hartpury highlighted their qualities at the Gillman’s Ground to clinch a 37-27 win. “Adapting is exactly what we have been looking at this season,” head coach Sean Lynn said. “It is about being adaptable in our games. It can be with the weather or the opposition so it is about being adaptable and our forwards came up trumps with that against Bath which I was particularly pleased with. Their unrivalled success in BUCS Super Rugby has seen Hartpury’s stock rise in terms of university rugby, but despite their repeated triumphs, Lynn was keen to stress the ‘will to win’ is always the same at the beginning of each season and that has helped Hartpury have another positive campaign. He added: “I know we won the Championship last year, but everything we say going into each year and what we said this year is that this current cohort of boys haven’t won the BUCS Championship. That was last year and this has been a new season. “They [Leeds Beckett] have some really good momentum and I think momentum is such a key thing to have going into the final, but we have that as well. For Hartpury, all eyes will now be on an unprecedented third BUCS Super Rugby title in a row. Players such as Robbie Smith, Ervin Muric and Elias Caven have all stood out – especially over the last few weeks – and Hartpury certainly have all the tools at their disposal to continue their love affair with Twickenham. “We are delighted to be here again,” said Lynn. “I just think it is a nice way to finish the season off, especially for some of the boys this year who have been with us for three or four years now. Hopefully we can finish it off with another win.